AMAZING STARTER HOME This 1 1/2-storey home feels like a 2-storey with 3 large bedrooms on the upper levels. The lounge, separate dining room and kitchen are all on the main level. PRIME LOT WITH LARGE DRIVEWAY Set on a generous 50 x 120 ft lot, there is a beautiful private rear yard, detached garage, and parking for a total of 4 cars. 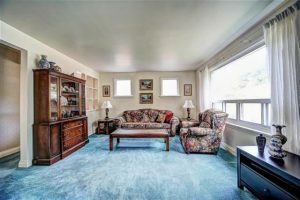 SO MUCH POTENTIAL This is a well maintained home with hardwood floors on a bright and sunny south-facing lot. Ready to move in and enjoy, then over time, great opportunities for some cosmetic projects. IDEAL FOR A FAMILY There is an excellent flow to the layout. The three large bedrooms have good storage, there is a linen closet, and the basement is partially finished with a rec room. GREAT LOCATION Situated in a delightful pocket surrounded by parks, trees, walking trails, rivers and creeks. Shopping, golf course and transit conveniently close. Inclusions Fridge, range-hood, stove. Laundry washer and dryer. All window coverings. All light fixtures(except chandelier in dining room). All in ‘As Is” condition. Hot water rented.